Our range of TETRA solutions test your digital radio network to give accurate, highly detailed results. 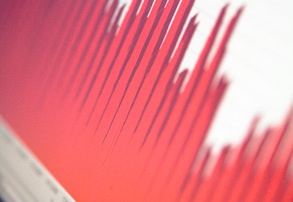 Our CDR tool and services offer advanced data analysis and cost saving benefits. Our managed service solutions provide you with an experienced, independent specialist - saving you time and money. Syntech Systems is an established, independent UK telecommunications company that has been a trusted name in the Emergency Services for over 15 years. We support the ESMCP, working towards delivery of the UKs first LTE critical network for the Emergency Services Network (ESN). 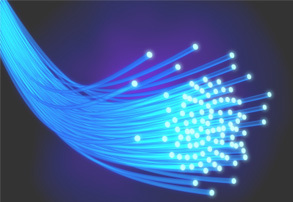 Syntech are providing Test & Measurement services for measuring in-building coverage, based on NEON. NEON's indoor location solution provides 3D monitoring and tracking of personnel inside and outside buildings. We are proud to be their UK partner and reseller. Find out more about NEON indoor tracking solutions. We specialise in TETRA network coverage, PESQ voice quality products and testing, Airwave and ICT technology. 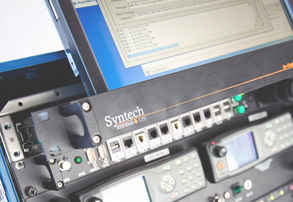 Syntech provide bespoke hardware, software and support for TETRA Communications performance monitoring throughout the UK and Europe. A key part of our business is providing solutions for the Airwave TETRA service to verify Service Level Agreements (SLA) & Key Performance Indicators (KPI). We design & manufacture a range of bespoke test & measurement equipment for Quality of Service (QoS) and TETRA drive-testing. Our Call Detail Records (CDR) solutions and expert analysis allow you to control costs & improve operational efficiencies. Contract management and consultancy services add to our experience and capability. With Syntech Systems you are in safe hands. 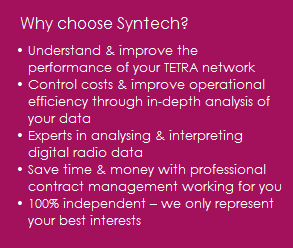 We’d love the opportunity to demonstrate how we can help transform the way you operate and get more from your TETRA radio network – contact the Syntech Systems team today. We're pleased to announce that our TETRA Quality of Experience system for the RENITA network in Luxembourg has been shortlisted for the 'Best Innovation' Award at the 2016 International Critical Communications Awards (ICCA).